4.5 22 Be the first to write a review! Heavy duty construction features a metal spray nozzle and rubber wrapped housing that won&apos;t rust or corrode. Heavy duty adjustable hose attachment. Great for home, auto, garden and more. Turn your ordinary garden hose into a power washer! Wash your car, water delicate plants, spray your lawn and more with this adjustable hose attachment. 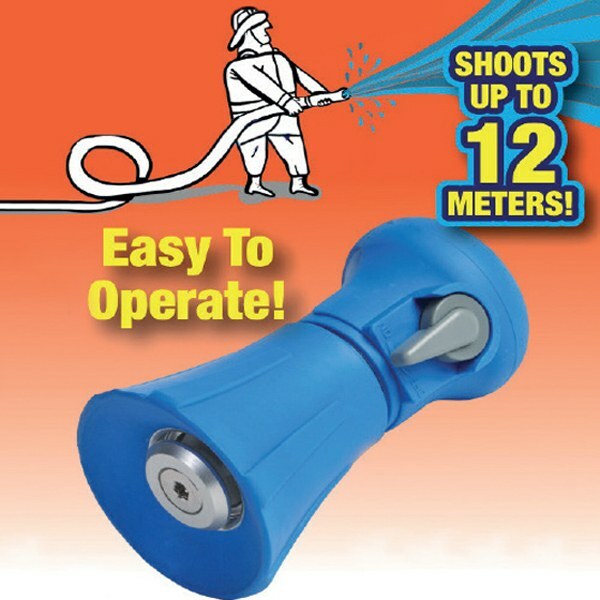 This universal nozzle looks and feels like a miniature fire hose and is perfect for every task around the house. It&apos;s true... you can utilize the power of a fire hose for your home cleaning projects just by hooking up this Fireman&apos;s Hose Nozzle to your ordinary garden hose. The amazingly powerful jet stream that can shoot water for several feet, perfect for those tough cleaning tasks. Adjustable spray pattern changes with a twist of the nozzle and includes an easy on/off switch that helps save water and time. The five settings (jet stream, soaker, fan, mist and spray) allow you to choose anything from the super-strong Jet Stream to a gentle Spray that&apos;s ideal for watering plants. Just twist to adjust- the perfect all in one nozzle.